Can you erase an eraser? The issue of Confederate monuments and memorials has reached center stage in the last week, although battles to remove Confederate symbols have been going on for a long time. My first experience with a Confederate monument or memorial was in Chicago in 1992. There was a proposal to landmark the Confederate Mound Monument, erected in 1895 in Oak Woods Cemetery, a great column topped by a sculpture of a Confederate soldier, arms folded, by Leonard W. Volk, an important local sculptor at the time. Volk had made his reputation through the life mask and hands he did of President Abraham Lincoln. 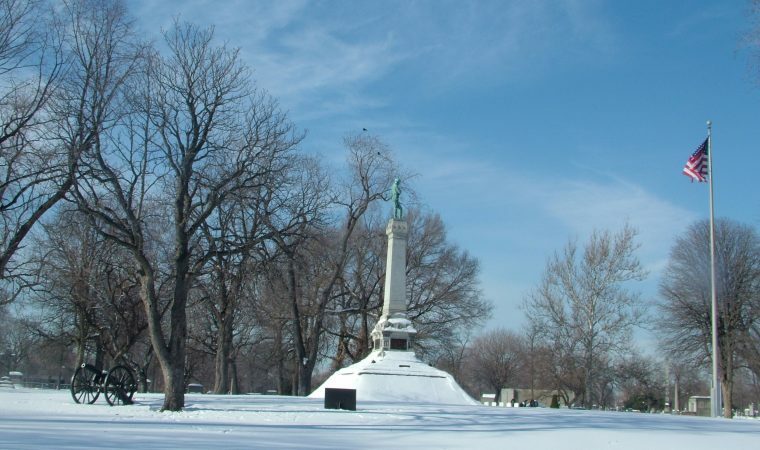 The Monument was a memorial to some 4,000 Confederate soldiers who died as prisoners-of-war in Chicago’s Camp Douglas. Indeed, unlike many of the monuments and memorials under discussion today, this one is in fact an actual grave marker with actual bodies underneath it. The issue here in San Antonio is interesting. In 1899 the Daughters of the Confederacy erected a monument in the center of Travis Park, a great column topped by a sculpture of a Confederate soldier, pointing toward the heavens. It is not an actual grave marker, meaning it is a cenotaph. Raised letters state “Our Confederate Dead”. 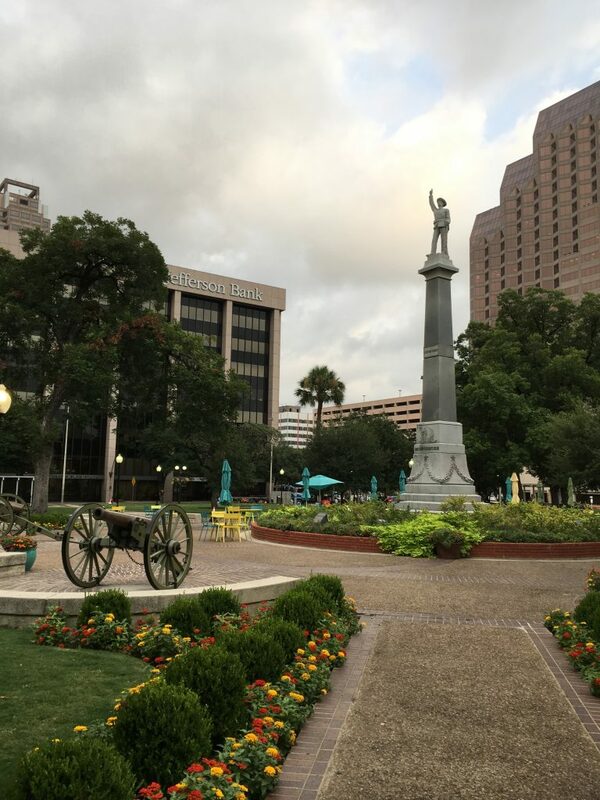 It is not a statue of a general like Robert E. Lee, despite the fact that Lee had a significant San Antonio history, albeit while he was still in the U.S. Army. It is a monument to soldiers who fell, not leaders who lost. It was built during the main period of construction of Confederate monuments from the late 1890s into the 1920s. This was the Jim Crow era following the Supreme Court’s 1896 Plessy v. Ferguson decision legalizing segregation, and these symbols were part of a cultural effort to maintain white supremacy. A similar spike in monuments and symbols came in the early 1960s with the Civil Rights Movement. Two Councilmen are proposing removing the monument to a museum. In contrast, writer Rick Casey proposed leaving it in place but contextualizing it by flanking it with the actual 1861 Texas secession statement cast in bronze. The statement makes it very clear that the war was about slavery and not the Lost Cause rewriting of the 1890s. The statue atop the monument is usually mistaken as a representation of Lt. James Travis, the Alamo commander who died in the 1836 battle (and whose slave Joe survived). This is an common confusion because it is in Travis Park. In fact, there was a plan to put the Alamo cenotaph (memorial) in Travis Park back in the 1930s but UDOC refused to move the Confederate monument. The National Trust for Historic Preservation released a statement this week that said in part “Ultimately, decisions about what to do with offending memorials will be made on a case by case basis at the community level. Some memorials can be moved, others altered, and others retained as seen fit. Whatever is decided, we hope that memorials that remain are appropriately and thoughtfully “re-contextualized” to provide information about the war and its causes, and that changes are done in a way that engage with, rather than silence, the past–no matter how difficult it may be.” This response suggests that memorials like San Antonio’s might remain if contextualized. 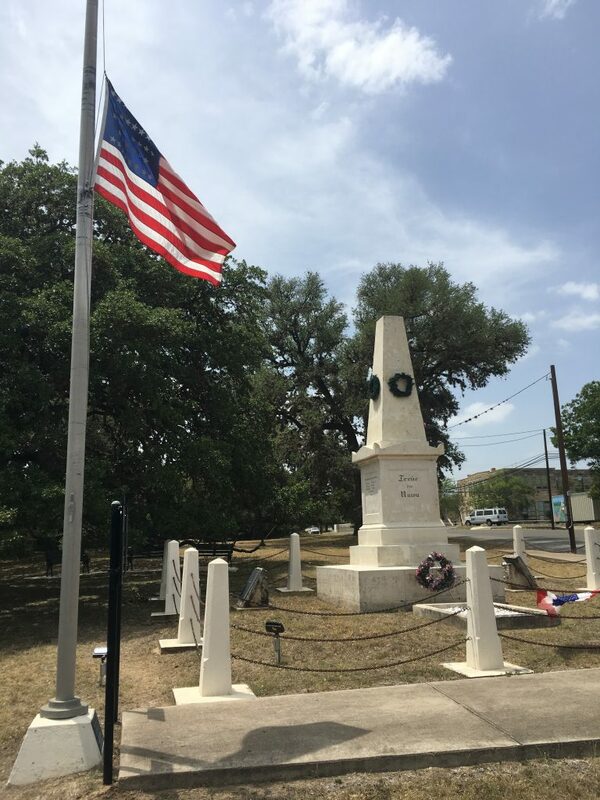 Just up the road in Comfort is the oldest Civil War monument in Texas, located atop Monument Hill. It was built in 1866 and is also a grave marker with actual bodies buried there. It is called “Treue der Union” and commemorates 36 German Americans killed by Confederates as they tried to flee the state. So it is a Union memorial, and one of only six sites in the United States allowed to fly flags at half-staff permanently. (The others include Pearl Harbor and Gettysburg). The German-Americans who were numerous in South Texas by the 1850s were generally against slavery and secession (as was Senator Sam Houston) and the three dozen memorialized here paid with their lives. What is a monument and what is a memorial? In German, there are at least four words for “landmark,” from the clearly honorific Ehrenmal to Mahnmal, an equally clear evocation that something is being preserved as a warning. Nie wieder – Never Again. They also have the more equivocal terms Gedenkstätte and Denkmal, the latter of which is the most common. In English we tend to think of a monument as a celebration, even when it is a memorial, but we have our Mahnmals as well. The National Trust statement is effectively asking us to make sure our monuments are relating history accurately – both the history of the Civil War and the history of Jim Crow monument-building. The great majority of Confederate monuments were built some two generations after the war as part of a process of enforcing discrimination and oppression. Defenders are concerned with “erasing history” or “fixing history” but the fact remains that these monuments themselves were designed to “erase” or “fix” history to conform to a particular ideological and cultural movement. So can you erase an eraser? 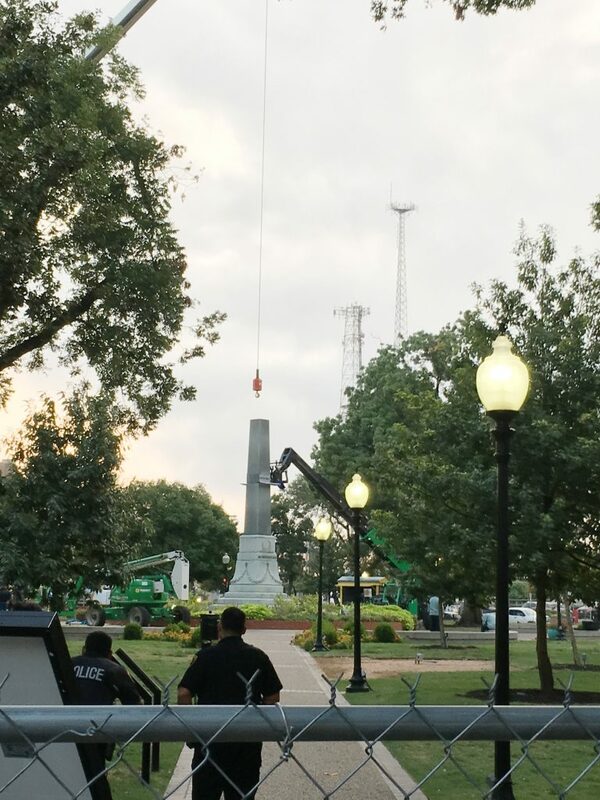 Yesterday the City Council voted 10-1 to remove the monument and the work began overnight.